I live in the Hawaiian Islands and this was the quickest I have ever received any product. 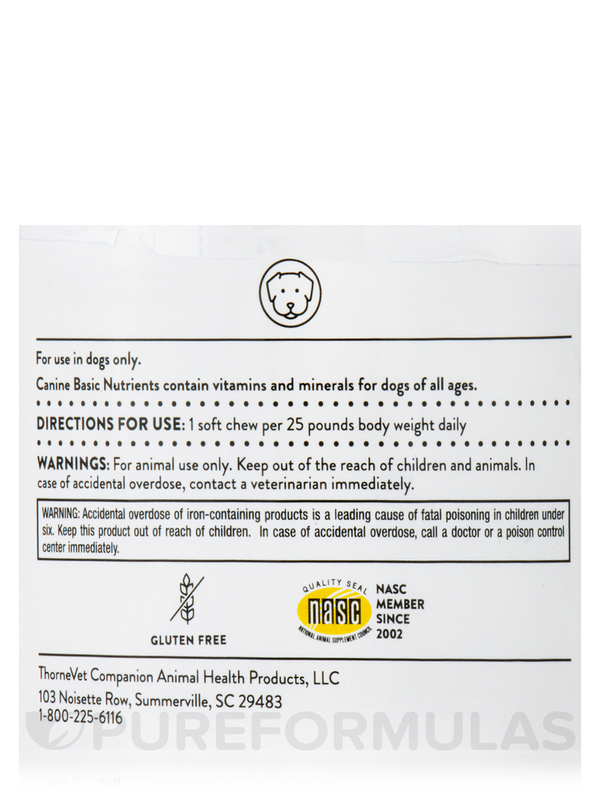 Canine Basic Nutrients is a multi-vitamin/mineral supplement for all phases of a dog's life. It offers a complete formula of essential and highly absorbable vitamins and minerals. Because of abundant environmental pollution and the shortcomings of modern processed food‚ it is difficult to know whether a dog is getting all the basic nutrients it needs for optimal health. By supplying a dog with a multi-vitamin/mineral formula early in its life‚ and certainly before a dog becomes old or ill‚ you can enhance the quality and length of the dog's life and optimize its vitality. 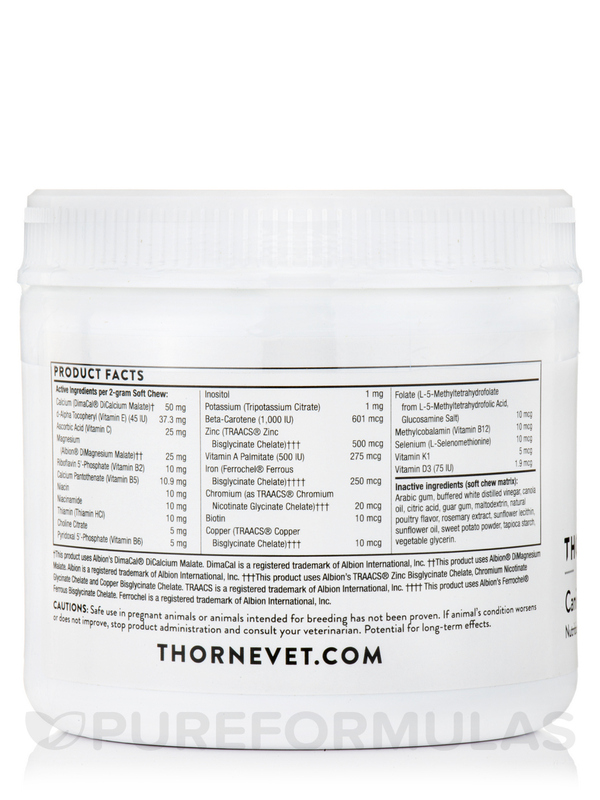 ThorneVET's Canine Basic Nutrients is intended for use in all phases of a dog's life. It provides a broad range of nutrients‚ to meet canine needs. The calcium‚ magnesium‚ potassium‚ zinc‚ copper‚ and iron in Canine Basic Nutrients are provided in highly absorbable forms. And vitamins B2‚ B6‚ B12‚ and folate are provided in their active‚ tissue-ready forms. Hypromellose (derived from cellulose) capsule‚ Microcrystalline Cellulose‚ Calcium Laurate. 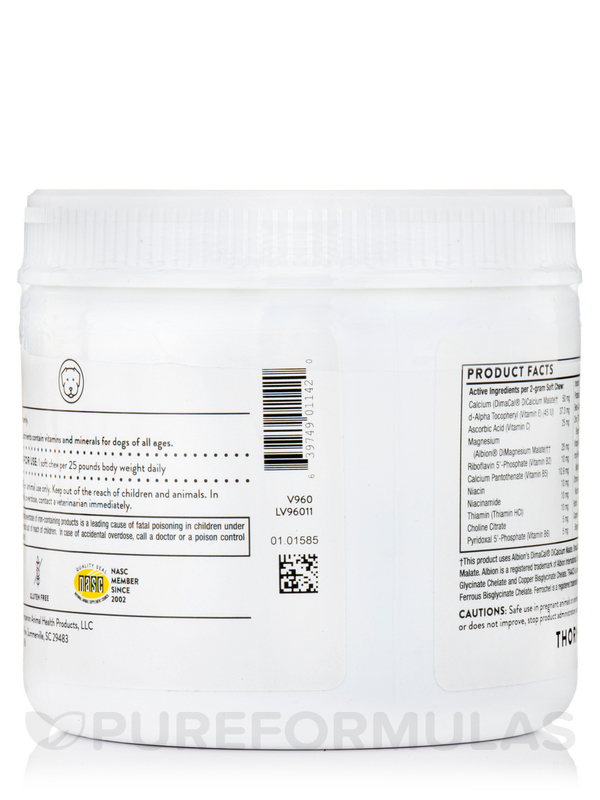 †This product uses Albion’s DimaCal® DiCalcium Malate. DimaCal is a registered trademark of Albion International‚ Inc. ††This product uses Albion® DiMagnesium Malate. Albion is a registered trademark of Albion International‚ Inc. †††This product uses Albion’s TRAACS® Zinc Bisglycinate Chelate‚ Chromium Nicotinate Glycinate Chelate and Copper Bisglycinate Chelate. TRAACS is a registered trademark of Albion International‚ Inc. †††† This product uses Albion’s Ferrochel® Ferrous Bisglycinate Chelate. Ferrochel is a registered trademark of Albion International‚ Inc. WARNING: Accidental overdose of iron-containing products is a leading cause of fatal poisoning in children under six. Keep this product out of reach of children. In case of accidental overdose‚ call a doctor or a poison control center immediately. I used this item years ago when it was recommended by my holistic veterinarian in Reno, NV. I stopped using this item and switched to Nupro. Lately, I have been concerned that one of my dogs might have a reaction to the yeast in Nupro, as he has allergies. 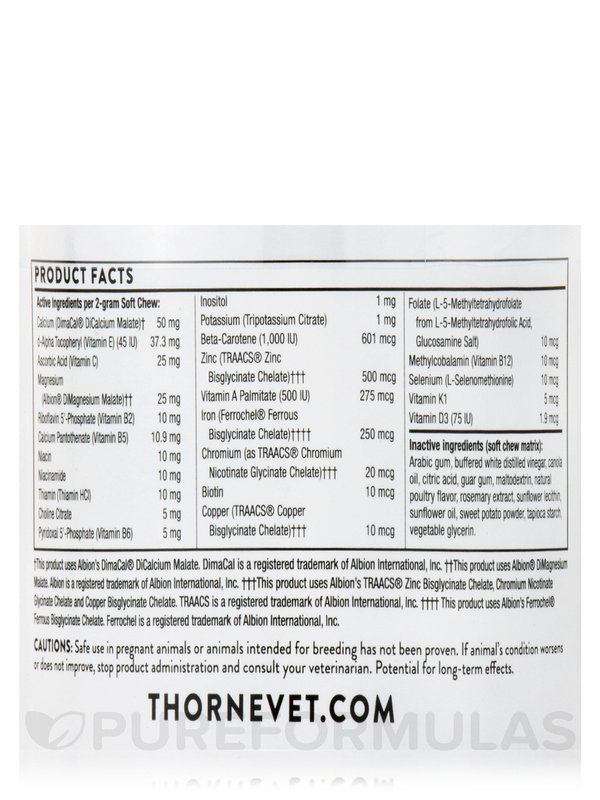 I was searching for a vitamin supplement and remembered Canine Basic Nutrients by Thorne Research that I used in the past. I am now using Canine Basic Nutrients for my three Cocker Spaniels with great success. I don't dislike anything about this item. 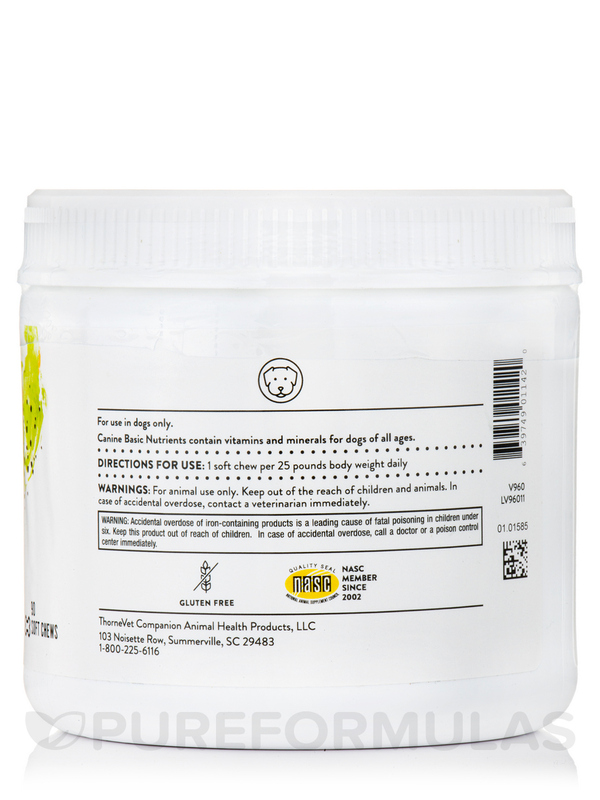 Canine Base Nutrients by Thorne Research makes my dogs coat shiny and I can be sure she is getting what she needs in her diet. The pills are difficult for my dog to swallow. I have to either use the Pill Pockets (which are expensive) or apply a ton of peanut butter on the pills. Otherwise, I wet the pill and put it down her throat (which I refuse to do). If I hide it in her food, she just spits it out. If you break open the capsules, you can sprinkle the powder into food or treats. 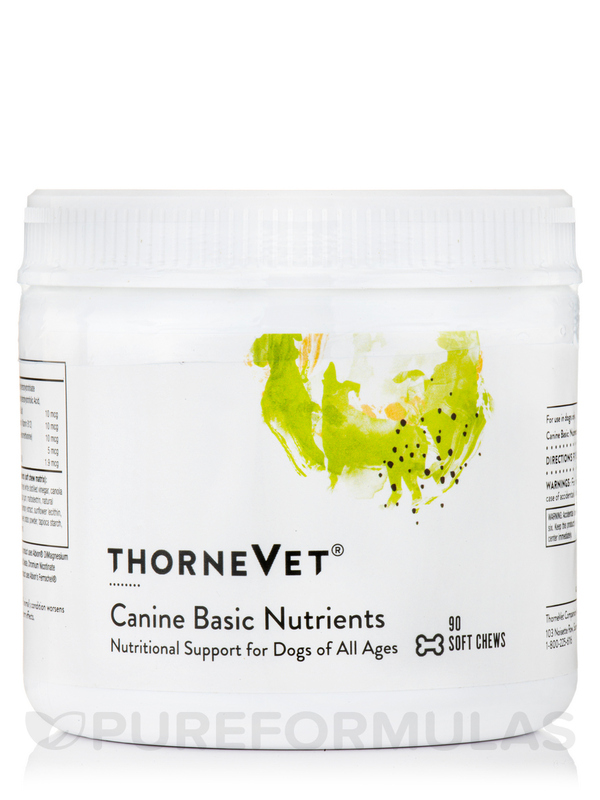 Canine Basic Nutrients by Thorne Research is a complete multi vitamin. The best!! !